Banstead has a lovely High Street – from the library roundabout along to the Woolpack – but sadly without help it may not be possible to have the festive lights. The lights make such a difference bringing a warm glow to the High Street in the dark wintery nights – and adding that touch of Christmas magic. 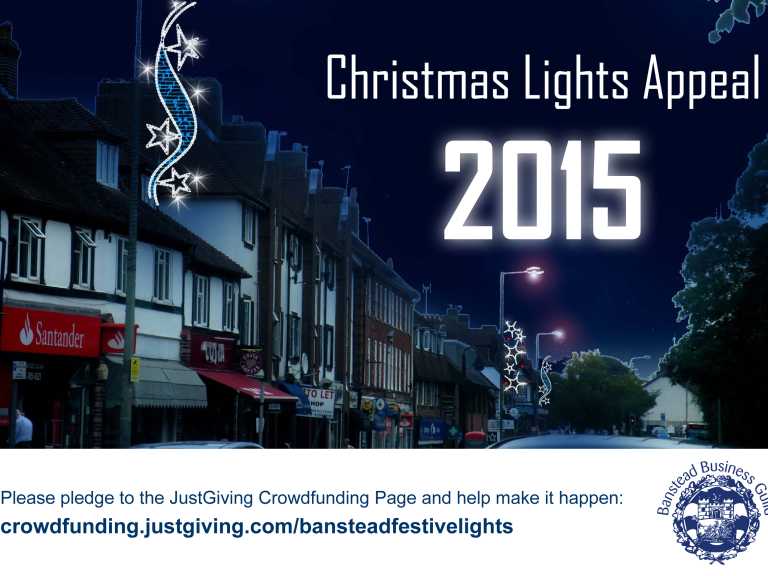 The recently formed Banstead Business Guild – comprising local businesses and traders have set themselves a task – to raise the funds needed to bring the lights back. The appeal goes out not only to businesses but to the whole community – and donations however large or small are all welcome. At the recent meeting of the newly created Banstead Business Guild it was agreed that, unless sufficient funding can be secured, it would not be feasible to install the Christmas lights along the High Street this year. It costs in the region of £3,000 to have the lights installed and taken down every year. Historically these costs have been met from an account set up in 1999 under a millennium appeal ‘Let there be light’, and some of the lighting in place today was purchased with these funds. However these funds have been exhausted and in recent years the burden for payment has fallen to a single shop owner, with the support of the Banstead Village Residents Association. The Business Guild has started to activity fund raise, in an effort to raise sufficient funds, but the support of the whole community will be needed if they are to be successful. The Business Guild is a membership organisation, and it has been agreed that membership fees will go towards the lights appeal. Membership is £50.00 per year. The Business Guild exists to promote the interests of the High Street to the wider area. Anyone interested in joining should contact Jon Tabard at JT Snuggs. Individual, or group, donations would be very welcome. Again Jon at JT Snuggs is the appropriate contact as holder of the ‘Let there be light’ account. Help spread the word as widely as possible about the situation. It would be fantastic to have a whole village response to ensure that the lights are in place for every-ones enjoyment. Business Guild members will also be supporting the appeal in their respective businesses. The Business Guild will meet on 10 November to review the success of fundraising activities, and to decide if the lights installation can be commissioned, or not. In the event that the fundraising total is not met, collected monies would be retained as a foundation for Christmas 2016.